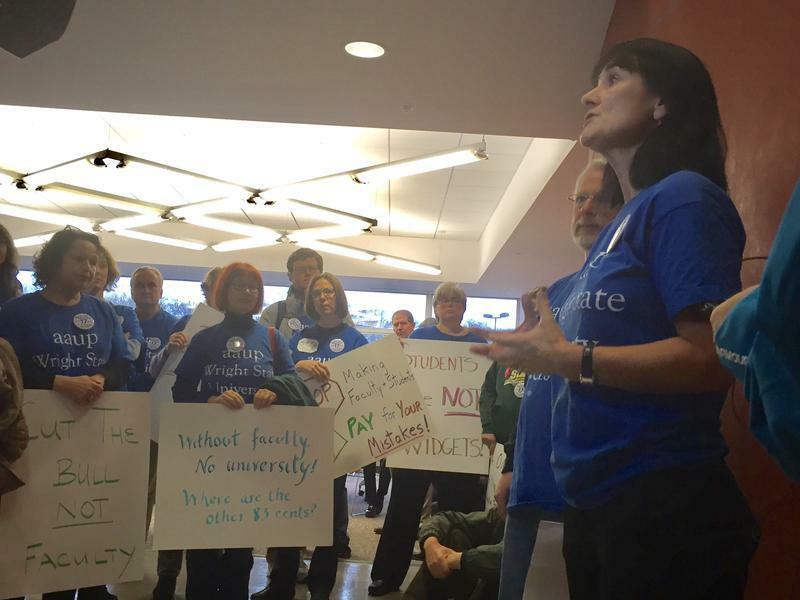 Dr. Noeleen McIlvenna addresses members of Wright State's faculty union at a protest in October 2018. Dr. Noeleen McIlvenna, with Wright State’s chapter of the American Association of University Professors, says faculty members want to avoid a strike. But, they feel the terms of the administration’s offer put the quality of education at Wright State at risk. "This would could drastically increase our workload. There are several elements of it in combination that would increase both teaching and service while silencing professors, attacking academic freedom. So we felt we had to take action immediately." McIllvenna says administrators have not responded to their requests for negotiation sessions since November, when union officials rejected an arbitrator’s fact-finding report. “Although the union has the right to call a strike, it is disappointing. Certainly, faculty members and their union understand the massive financial challenges the university has confronted in recent years. “The employment terms are fair in light of our unprecedented financial crisis, and the actions we have taken to respond to the crisis. Under the terms of our last and best offer, our faculty would continue to enjoy higher salaries than their peers at similar state universities. Faculty would also receive the same competitive healthcare benefits provided to all other Wright State employees. “The university cannot continue on the path to financial sustainability by maintaining the status quo. Our other Wright State employees understand this, and have accepted reasonable concessions. We are asking the faculty to do the same. “We have negotiated in good faith for nearly two years, and these employment terms reflect our continued good faith. We have kept in place the current retrenchment and layoff procedures to ease any faculty concerns, and will work with the Faculty Senate on a workload policy," Schrader said. In a Friday statement, Administration officials also noted their final offer includes a concession eliminating their proposed changes to faculty layoff policy. Union representatives had objected to those changes in prior negotiation sessions. The statement goes on to say university trustees felt it was necessary to, "move the university forward beyond," ongoing stalled negotiations. "Throughout this bargaining process, while navigating significant financial recovery, we've been focused on the fiscal sustainability of the university now and in the future," Doug Fecher, chair of the Board of Trustees, said in a statement. "We want to ensure that Wright State remains what its more than 15,000 students and the region need it to be — a thriving public research university supporting our two campuses." If a deal is not reached, the union’s more than 500 members plan to walk off the job on January 22 at 8 a.m., about a week after students return from winter break. "While faculty were working under the old contract, Wright State avoided fiscal watch and generated a $10 million surplus last year. But the Schrader administration and the Board continue to use the Board-created financial crisis as an excuse to undermine fundamental principles of higher education adhered to at virtually all American universities. The imposed contract also eliminates our right to negotiate over healthcare. It would immediately result in Wright State faculty having the worst healthcare plans among Ohio’s state universities and provide the administration with unlimited authority to further slash coverage at their whim. Many other articles in their imposed contract diminish the faculty voice in university decisions. Dr. Kich said, “Our faculty have been attempting to resolve this contract without a strike for twenty-four months, but our attempts have been repeatedly rebuffed. This reckless Board needs more faculty input and oversight, not less,” the statement reads. Editor's note: This story has been updated to reflect the filing of the AAUP strike with the Ohio State Employment Relations Board.